Michel Bistro brings a slice of the south of France to Lakeshore Avenue. 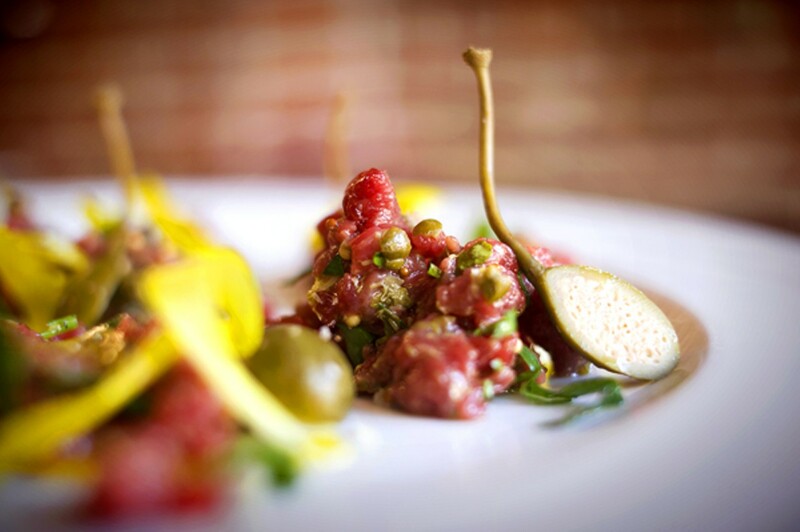 The pleasures of the bison tartare are mostly textural. Hours: Tue.-Sun. 5:30-9:30 p.m., Sat.-Sun. 10:30 a.m.-2:30 p.m.
For frequent restaurant-goers in Oakland, it often feels like all the world's cuisines are within reach — unless what you crave is a proper French bistro. Michel Bistro, which opened in the Grand Lake neighborhood in April, is a welcome arrival, then. Owned by Germain Michel, who also runs Amelie (a wine bar with locations in San Francisco and New York), and his business partner Jean-Michel Fabregon, who oversees the bar program, the restaurant is unobtrusive-looking from the outside. But the interior is surprisingly spacious — bright and airy, with exposed wood beams and multiple skylights that bring to mind a rustic hunting lodge. Mostly, though, the place just feels very French. At the slightest sign a customer might be a French speaker, the gracious servers switch gears and do the whole transaction in their native tongue. (They suspected me of no such thing.) Dialogue from Marius, a classic Marcel Pagnol film set on the Marseilles waterfront, is printed on one wall — a tribute to the restaurant's focus on the food and drink of Southern France, Michel explained. The food tastes very French indeed. But chef Anthony Salguero (who previously cooked at Plumed Horse in Saratoga and at San Francisco's Commonwealth) also draws heavily on the Bay Area's storied Cal-French tradition. Rustic bistro dishes are made slightly lighter and brighter, with local and seasonal ingredients. 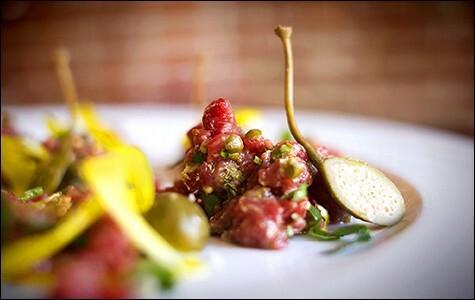 Take the bison tartare, which replaces the traditional raw minced beef with bison — chosen because of the meat's leanness and subtly gamey flavor, Salguero said — that's coarsely hand-chopped. The dish struck a fine balance between the savoriness of the meat and the vinegary tang of the various pickled elements, but the pleasures it offered were mostly textural: The main elements — the bison, the long-stemmed caper berries (a mellower substitute for caper buds, which are more common), and the whole mustard grains (which Salguero pickles in-house) — all "pop," caviar-like, in your mouth. If you really want to test a French chef's cooking chops, order the soup. One spoonful of the green-garlic cream soup that was on offer during my first visit was enough to convince me of the kitchen's pedigree. I loved its velvety texture, and the deeply earthy, almost mushroom-like, flavor of the leek-and-green-garlic stock. A dollop of tangy goat cheese; fresh cherries; and a scattering of smoky Serrano ham "chips" completed the complex, well-balanced dish. Slices of rustic bread — which came, quaintly, in a burlap sack — saved me the embarrassment of having to lick the bowl. For another stunner of a first course, a long marrow bone was split lengthwise, then roasted until its insides were soft and jiggly. The accompaniments made all the difference: thick slices of toast, which we spread with cloves of roasted garlic and some of the marrow, which was topped with horseradish and, for a bit of acid, some citrusy wild sorrel. Entrées, too, mostly consisted of subtle riffs on classic bistro dishes. The moules frites featured perfectly cooked mussels — small, plump, and sweet — that were served in a tasty, Pernod-infused broth that was brightened by the inclusion of preserved lemon rind. The fries were hot and crisp, and served with a simple aioli. The portion size was generous — but not dishearteningly so. For a trout entrée, the fillet was seared, skin side down, until a beautiful crust formed, leaving the flesh underneath tender and moist, if a bit underseasoned. I liked the "Lyonnaise"-style potato salad that came with the trout — crispy potatoes; thick cubes of bacon; lightly dressed salad greens; and O-shaped, slightly sour green almonds — but wished for some kind of sauce to bring it all together. And the lamb burger was good enough that I'd go back just for that: a thick patty (70-percent lamb and 30-percent beef, Salguero said) topped with aged English cheddar and sweet, slow-cooked onions infused with Vadouvan curry, all served on a Petits Pains poppy-seed bun. The combination of flavors — salty, sweet, cumin-y — was excellent, without overwhelming the natural sweetness of the lamb itself. The beverage list focuses on pastis, an anise-flavored French liqueur that is especially popular in Provence. There's also a streamlined all-French wine list, divided into three price categories, with each wine available in four serving sizes. If, like me, you're often content to share a half-bottle of a simple table wine, there are six to choose from, and it'll only set you back $13. On the other hand, desserts don't appear to be the restaurant's strong point. During our visit there were two basic options, and the one we tried, the chocolate fondant, was a pretty standard-order molten lava cake whose only flourishes — a sprinkle of lime zest and salt — added a bizarre, margarita-like flavor to the mix. Michel Bistro does, however, serve a damn good, if still slightly under-the-radar, weekend brunch. The pain perdu was great: Thick slices of rich, not-too-sweet, batter-dipped brioche were pan-fried until the edges crisped, then topped with macerated strawberries and several dollops of crème anglaise that pooled on the bottom of the plate like melted vanilla ice cream. Eggs Benedict, served on a long slice of rustic bread with the crusts cut off, had a scattering of over-dressed arugula I could have done without, but the core components — tender asparagus spears; thick, tangy hollandaise; Serrano ham; and, best of all, two wonderfully oozy-yolked poached eggs — were close to perfect. While no one would fault you for going the typical mimosa route, for a morning drink that's fairly uncommon at restaurants outside of France, try a citron pressé, the lemon lover's lemonade: A half-glass of straight lemon juice served on the rocks for you to doctor up with sugar and water as you please. For lunchier brunch-eaters, there are several sandwich options, including that lamb burger. And would you believe me if I told you that a plate of bison tartare makes for a refreshing — dare I say reinvigorating — start to the day? I'm told the French have known this for years. For the rest of us, it's one of many pleasant surprises waiting to reveal themselves at Michel Bistro.